Weihnachtsgans or German Christmas goose is the preferred fowl choice, along with duck, for festive occasions. Turkey is rarely seen on holiday dinner tables. Goose, for that matter, is rarely seen anymore, as well, which is a shame because it is so simple to prepare. Like other poultry, onions, ​thyme, and fruit are great seasoning choices with goose. Wash and dry the goose, like you would a chicken or turkey. Sprinkle salt, pepper, and thyme inside the cavity and fill with apple quarters and onions. If they don’t all fit, you can cook them alongside the goose in a small, buttered dish. Mix 1 tablespoon salt with 1 cup of water and pour that into the bottom of the roasting pan. Place the roasting rack on top. Pierce the goose skin in several places to let the fat drip out as it cooks. Put the goose, breast-side down, on the roasting rack and place in oven for 50 minutes. 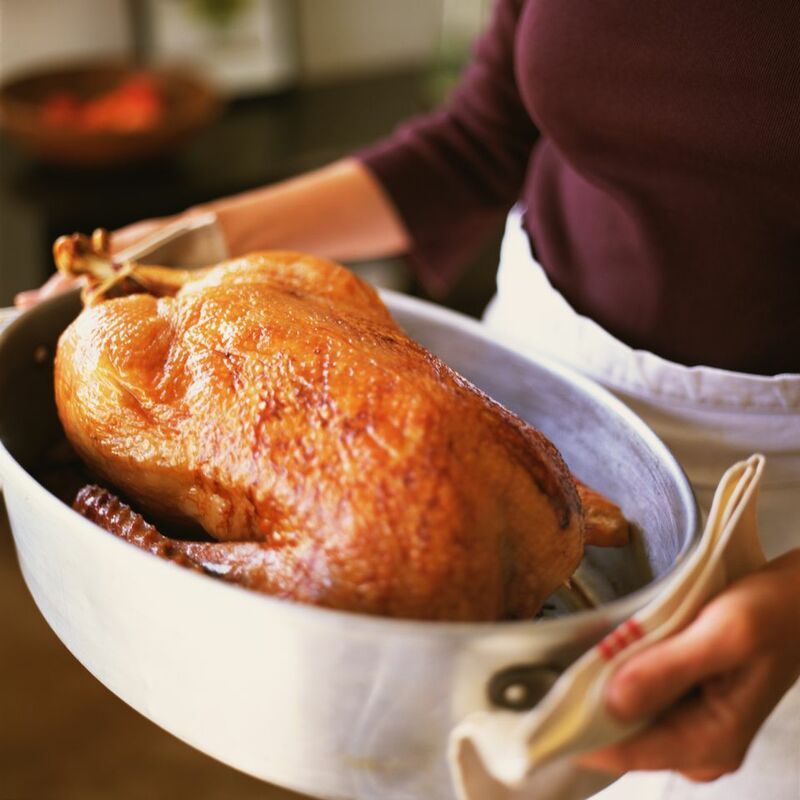 Use the salt water mixture to baste the goose several times during this period. Add more water to drip pan if necessary. Turn the goose over onto its back and cook, basting as needed, for 50 minutes. Let the goose rest for 5 minutes as you make the gravy. Mix 2 tablespoons of the fat drippings with 2 tablespoons flour in a small saucepan and cook for 1 minute. Gradually add the chicken broth, stirring well after each addition. Add salt, pepper, and thyme, if desired, to taste. Keep warm. Serve the goose and gravy with canned peach halves decorated with currant jelly (if you don't want to make currant jelly or can't find it prepared., cranberry sauce is a fine substitute), buttered Brussels sprouts, potato croquettes (or mashed potatoes), and the cooked apples and onions. Christmas is celebrated with great zeal in Germany and treats like Christmas cookies, Christmas stollen, and lebkuchen cookies are served at family dinners and for entertaining, when they are often made into brightly decorated bundles to be given to guests as party favors.